A woodgrain table top that will give you a beatiful, solid surface to compose on. As part of our WBR series, the Alvin Table Top will give artists not only a polished, beautiful surface to work on, but a solid one as well. Measuring at 30 x 42, the Table Top allows for projects of whatever size the artist will need. 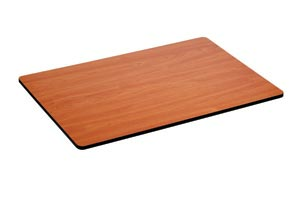 The Top itself features a cherry woodgrain surface, comprised of Melamine on both sides. The edges are covered in black vinyl and the Table also comes with smooth rounded corners, making it much safer to move around. And underneath the beautiful surface is the solid core construction that promises artists the sturdiest, most dependable area on which to draw. Base (legs) not included. So if you've got a frame that needs a drawing table top that's not only solid, but looks beautiful and can be moved easily, look no further then the Alvin Table Top.